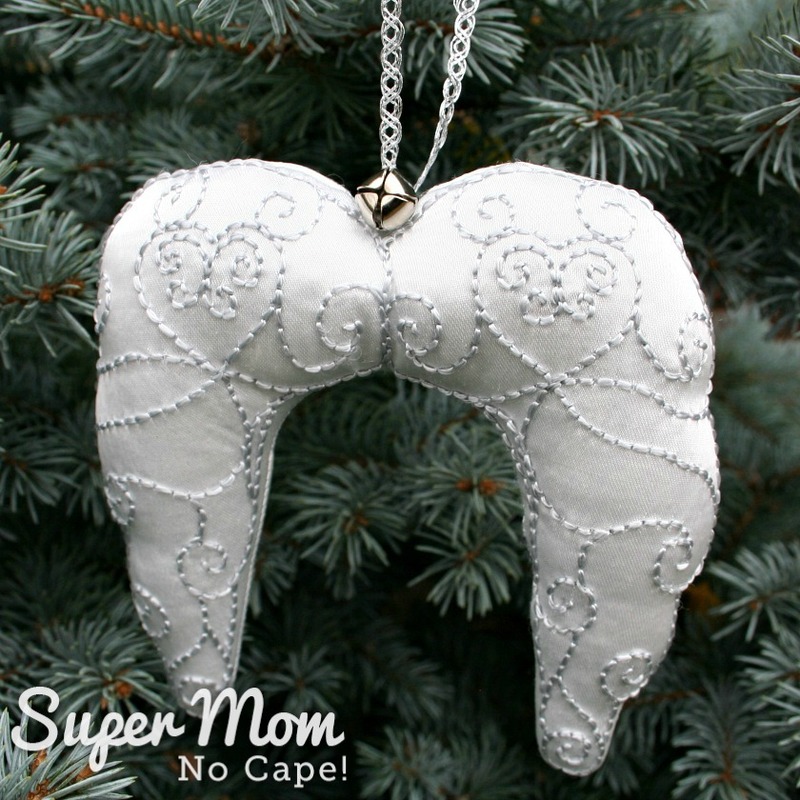 In the Christmas movie classic, “It’s a Wonderful Life” there’s this iconic line: “Every time a bell rings, an angel gets it’s wings.” That was the inspiration for this Embroidered Angel Wings Ornament with the tiny bell tied on top. I’m taking part in the yearly ornament exchange organized by Erlene from MyPinterventures for the second time. I had so much fun creating the handmade ornament for my partner last year, that I couldn’t wait to sign up again. This year, I was paired with Megan, from over at C’mon Get Crafty. In our introductory emails Megan mentioned that she and her family are huge movie fans and watch classic Christmas movies on rotation. As soon as I read that I knew exactly what I wanted to make for her. I’ll admit I had a few false starts and ended up switching out fabrics and floss colors. But I hope you’ll agree that in the end they turned out beautiful. 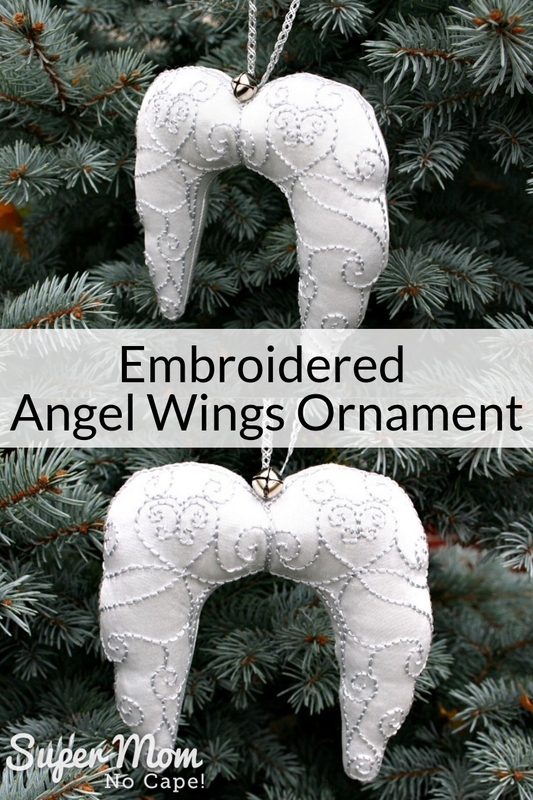 Before we get to the tutorial for how to make the Embroidered Angel Wings, I wanted to mention that I’m only one of 50 bloggers who took part in this year’s handmade ornament exchange. At the bottom of this post, I’ll link to where you can go see all the other ornaments that were made and exchanged as well as have a chance to link up your own tutorial, if you have one. So be sure to check that out! Next you’ll need to stabilize the satin with interfacing. Satin has a tendency to flex and shift. The interfacing prevents that and makes for a better stitching experience. Quick tip: Satin fabric and satin floss also have a tendency to snag, so I recommend that you keep a nail file handy to file any catches on your nails. As well, this time of year, my hands can be dry so before I work with delicate fabrics. I massage a bit of pumice foot scrub into my hands especially the finger tips and then rinse and dry my hands thoroughly before starting embroidery and sewing projects. This smooths out any little bits of dry skin that can snag and catch the fibers of the fabric and/or floss. I use Dr Scholl’s for Her Pumice Foot Scrub but it’s been discontinued. When I run out of what I have, I’ll be switching to a similar pumice foot scrub. 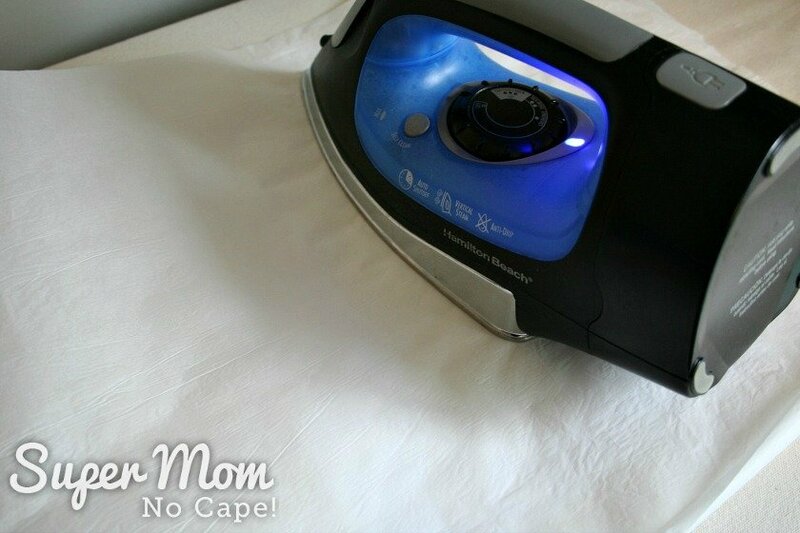 Fuse the featherweight interfacing to the wrong side of the satin using a medium heat setting on your iron. 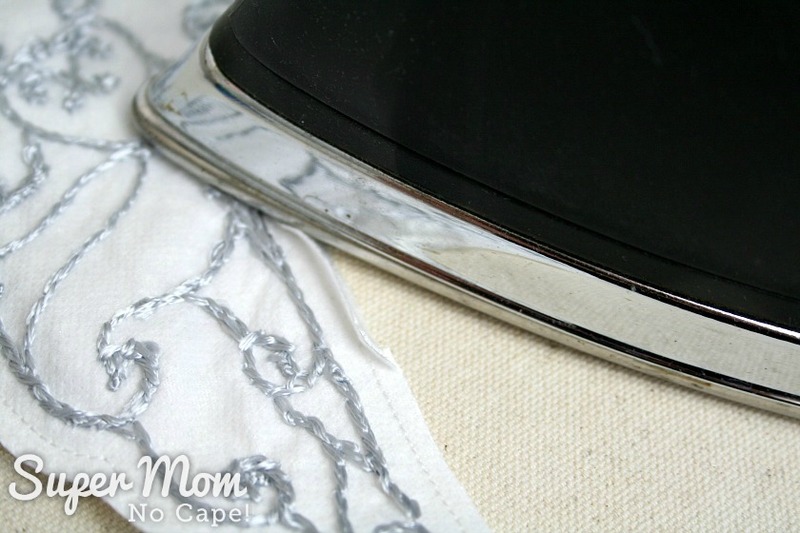 You may want to do a test on a small scrap of the satin to make sure that your iron isn’t too hot. 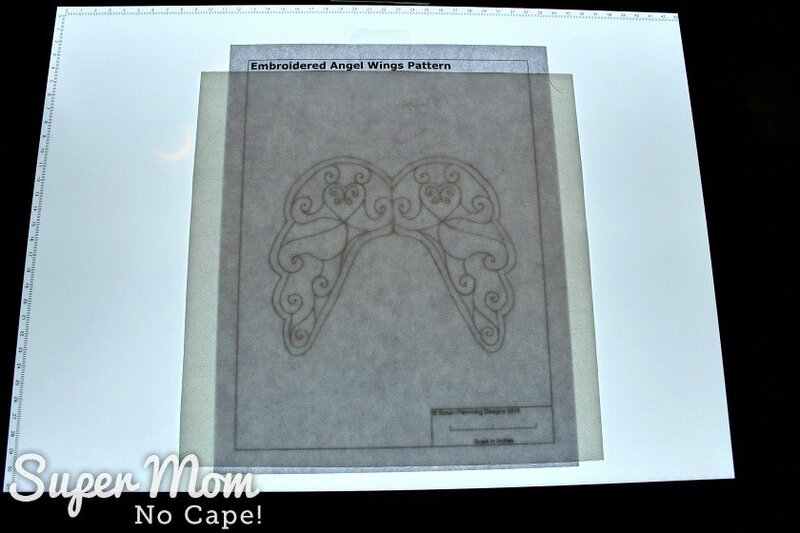 To trace the Angel Wings embroidery pattern onto one of the reinforced satin squares, you’ll need a light source. You can use a window or a homemade light box as your light source. But I’ll be honest…one of the best and most comfortable to use light sources are these Huion LED Light Pads. Hands down, it is one of the best craft room investments I’ve ever made. For tracing on the satin, use a regular pencil. I tried tracing with the Clover water soluble pen I usually use but the ink bled on the satin making the pattern a mess of blurry blue lines. 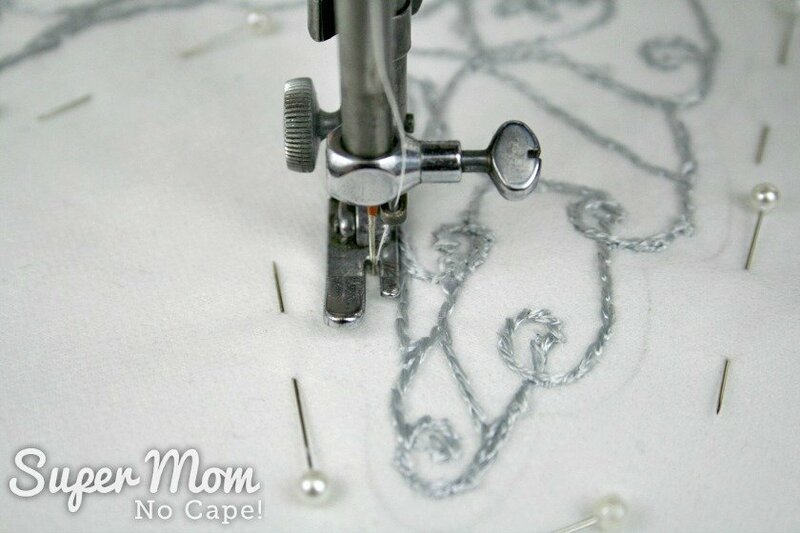 Once you’ve traced the pattern onto the satin, embroider the wings using 2 strands of the pearl grey satin floss. 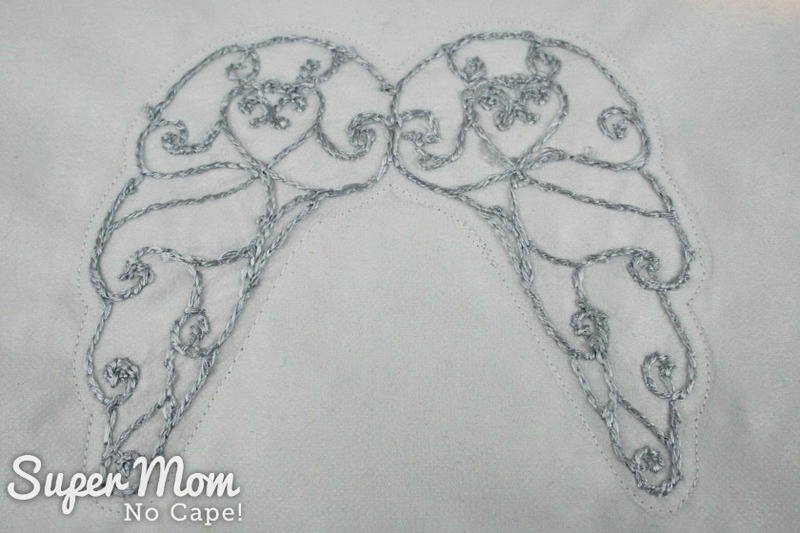 Give the embroidered wings a light pressing after all the stitching is complete. 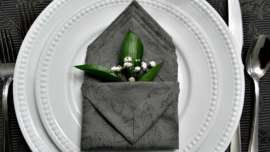 I use a small white towel or facecloth underneath when pressing my embroideries. This helps to prevent the stitching from being flattened by the iron. Start by pressing with the right side down and then flip the piece over and very lightly press out any small wrinkles on the right side. 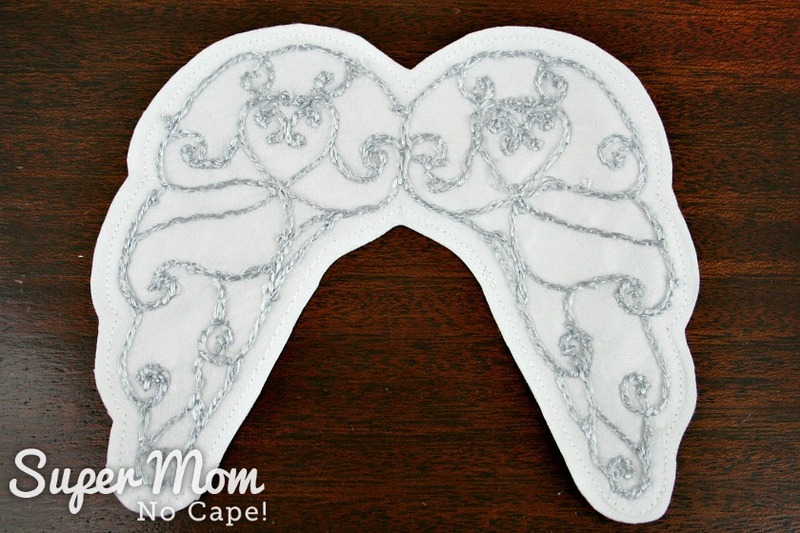 Pin the second square of satin right sides together with the embroidered angel wings. 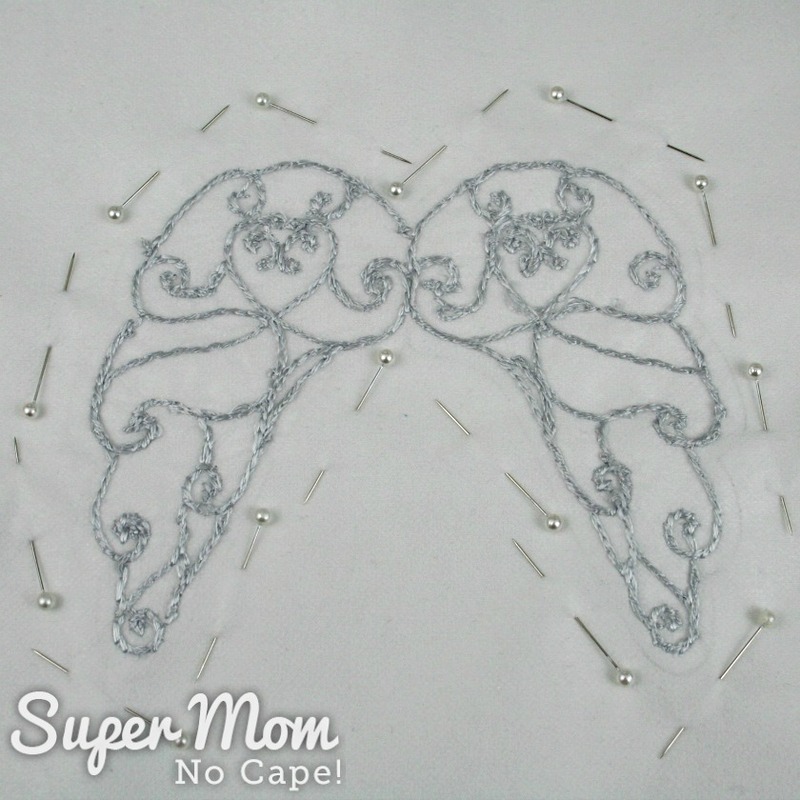 Make sure that all your pins will pull out in the same direction so that it’s easy to remove them as you sew around the angel wings. 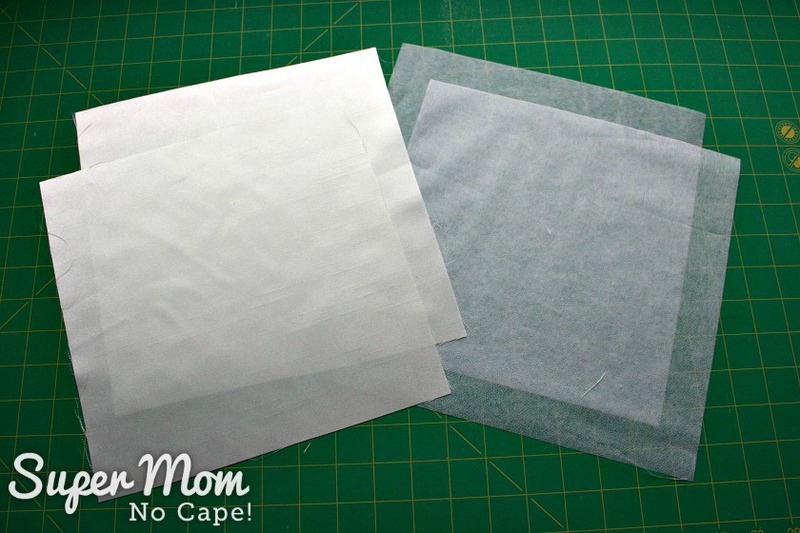 Sew using approximately an 1/8″ seam allowance. My vintage Singer sewing machine’s pressure foot is 1/8″ on the right hand side, so I was able to use that as a guide all the way around. Or you can simply sew on the outside lines of the pattern. 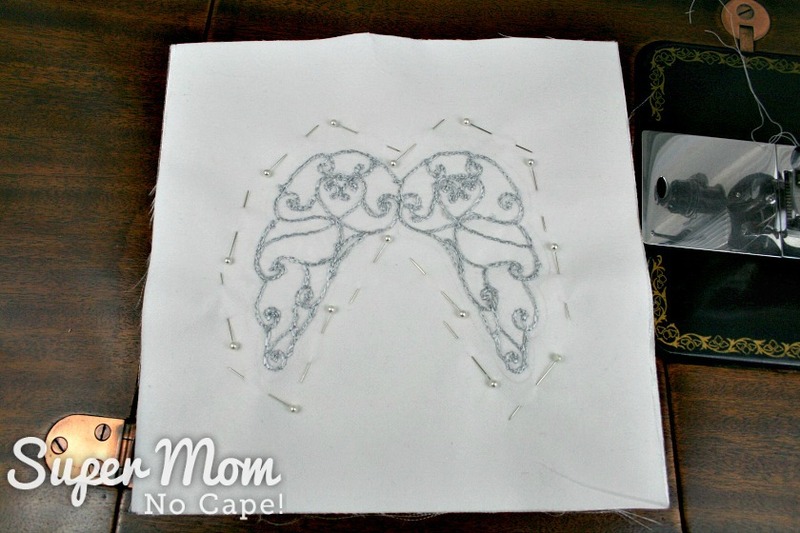 The piece will look like this after sewing. If you look closely, you’ll see that I adjusted the stitch length to a long basting stitch where I wanted the opening. You’ll see why in a moment. 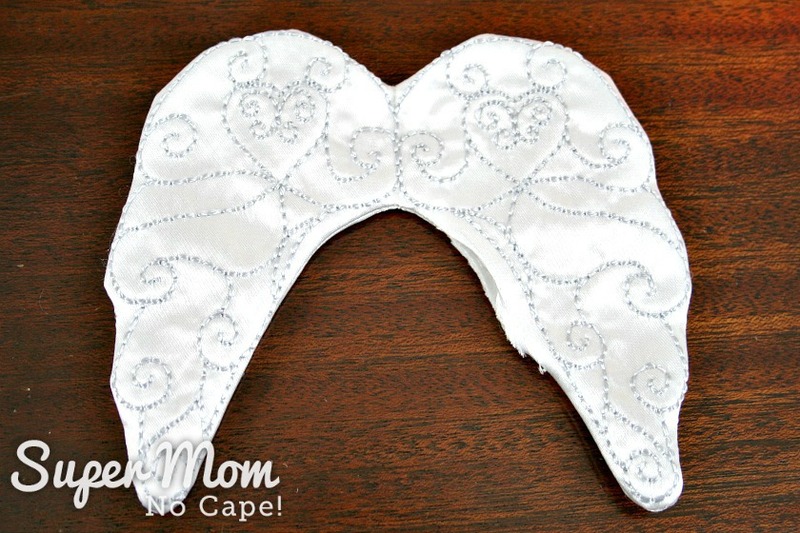 Cut out the angel wings about 1/8″ from the sewn line. Press open the seam allowance where the machine basting stitches are. Pressing that area of the seam allowance open, gives you a nice crisp pressed edge to sew into when it comes time to close the opening. 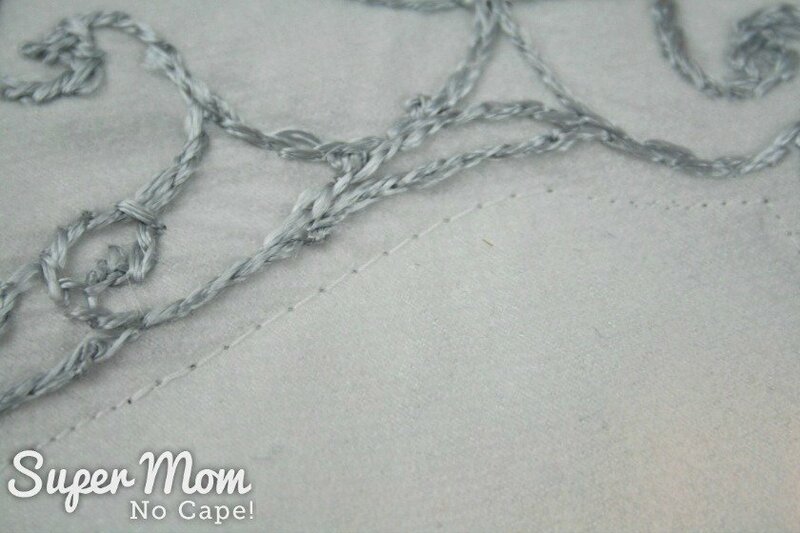 Remove the basting stitches and turn the angel wings right side out. Now it’s time to stuff the angel wings. A locking surgical clamp Isn’t absolutely necessary but it sure makes getting polyester filling into the bottom of the wings easier. Grab small pieces of polyester filling at a time with a surgical clamp. 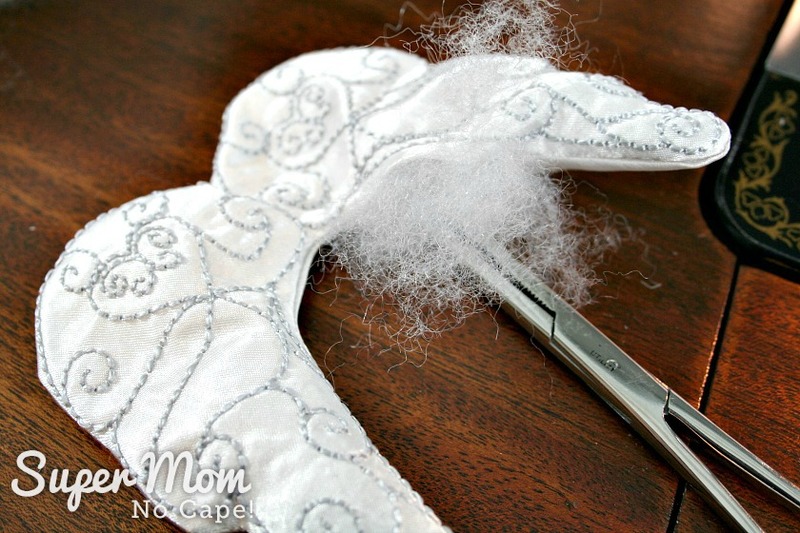 Insert the clamp with the polyester filling into the angel wings and move the filling to the place you want it. Release the clamp. The closed end of the clamp can then be used to push the filling further into position. 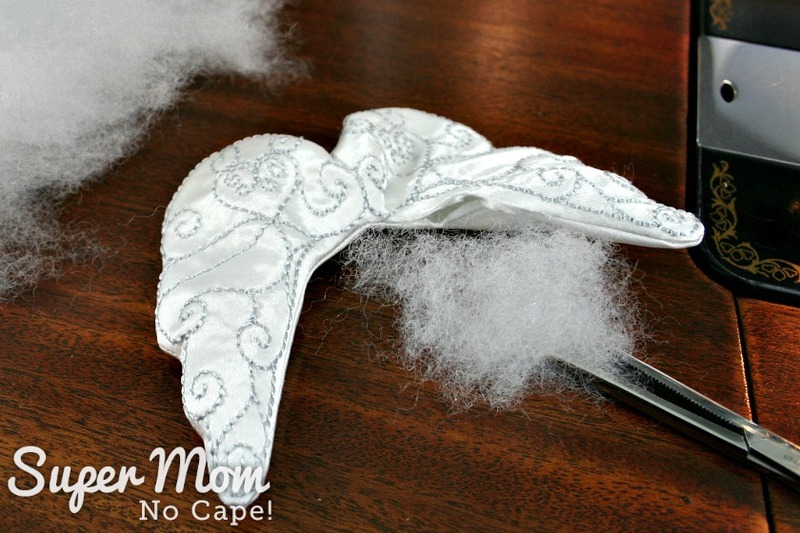 Fold the 18″ piece of ribbon in half and sew it to the top of the embroidered angel wings in the center between the two wings. 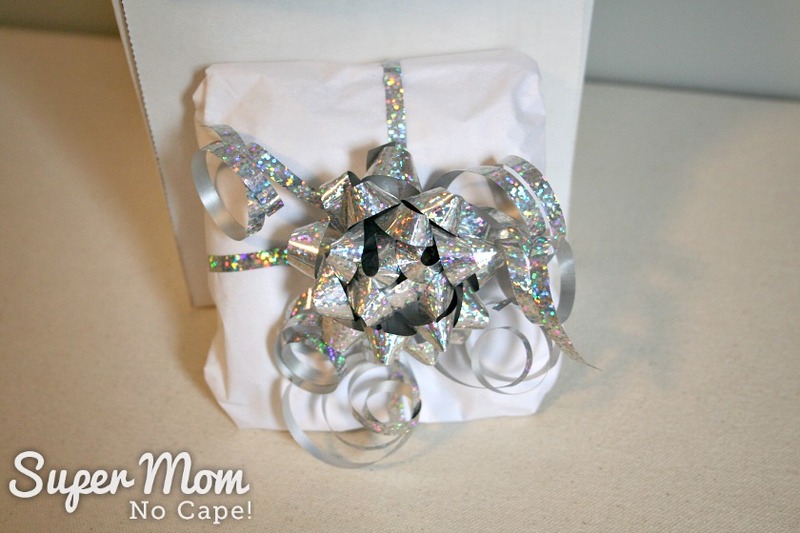 Thread the jingle bell on to one piece of the ribbon and knot to hold it in place. Tie the ribbon with a small bow about 4″ from the bells to create a hanging loop for the ornament and it’s ready to hang on your tree or to give as a gift. 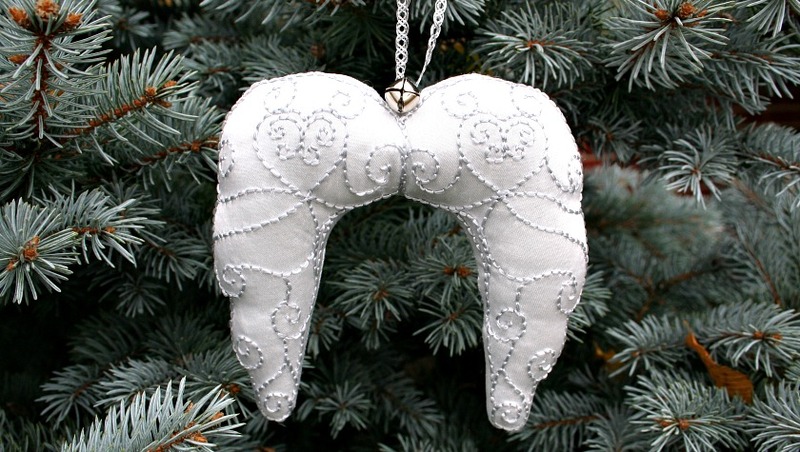 I hope that Megan loves the Embroidered Angel Wings Ornament that I made for her. The deadline to mail out the finished ornaments to our exchange partners was November 9th so it’s already on it’s way to her. 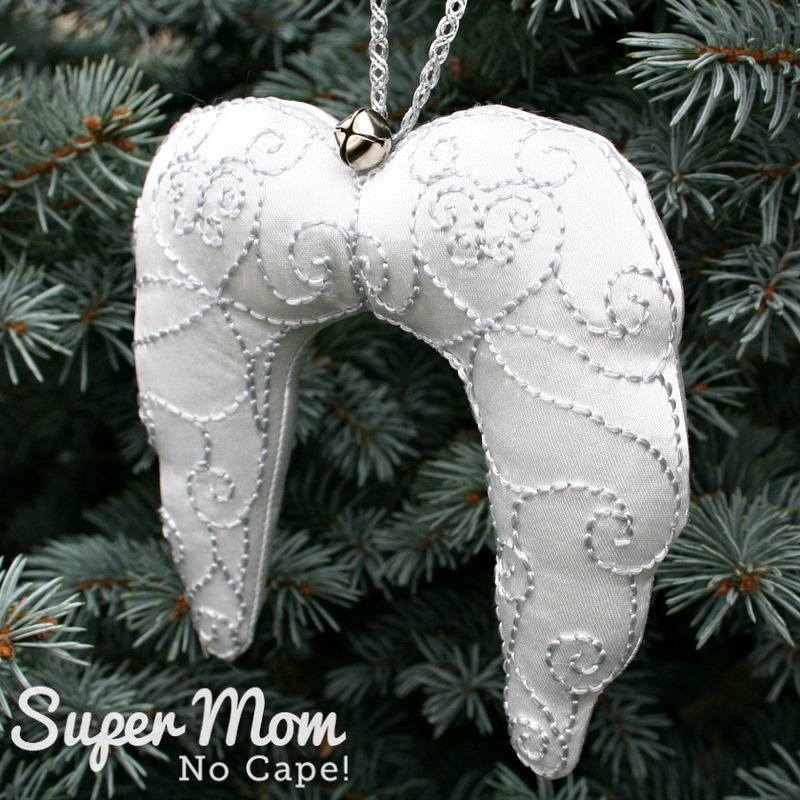 Want to see all the other handmade ornaments from bloggers who took part? 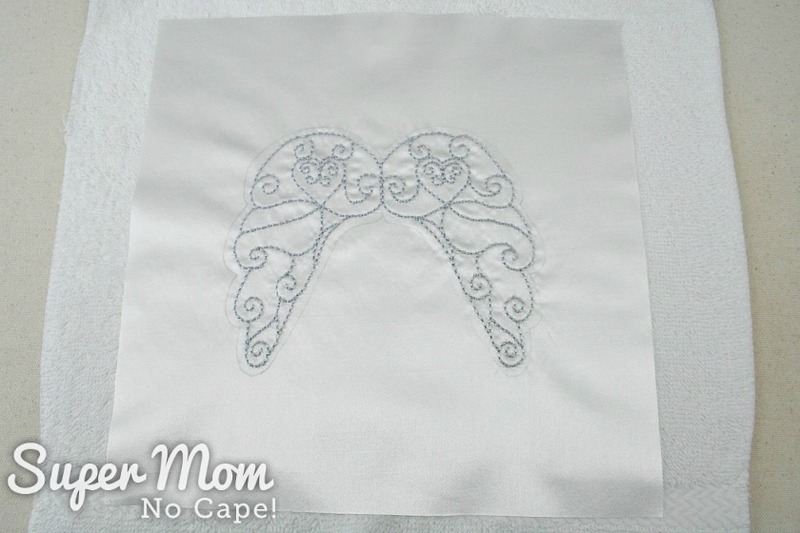 Be sure to save this post for Embroidered Angel Wings Pattern so you can find it when you want to make it by clicking on the Pinterest button underneath the post. That’s turned out really well! Even when the idea is simple, sometimes it takes a while to make it “just right”, but you’ve succeeded triumphantly here. What a lovely compliment! Thanks so much Rachel! Love your Angel Wings you did a lovely job in crafting them and I’m sure Megan will love them, the bell is the perfect touch after all it is a Wonderful Life. Thank you for including the pattern I hope to have time to give them a try. Beautiful!!! Love to see it but I have more ornaments then I know what to do with!!! i am sure Megan will love it!!! That is a really beautiful and thoughtful ornament. Pinned. Thank you so much Joanne for your sweet comment and for pinning! Wow, I love the embroidering and what a beautiful ornament~ I am sure Megan loves it! This is just gorgeous! I love the reference to the movie with the little bell on top. 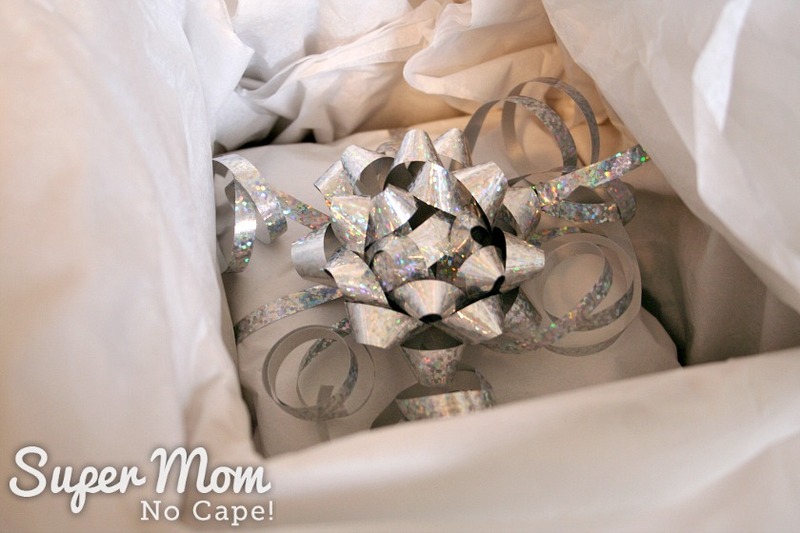 Thank you Roseann for your sweet comment and for pinning! Such detail and perfectly spaced stitches! This shows real patients and talent.